Learn all about Maine’s marijuana laws and how easy it is to get your medical marijuana card. It has been two years since recreational cannabis use was legalized in Maine, yet many people are still wondering how to legally buy medical marijuana and if they still need a card. This article will answer all of your questions about how to legally buy marijuana in the state of Maine. 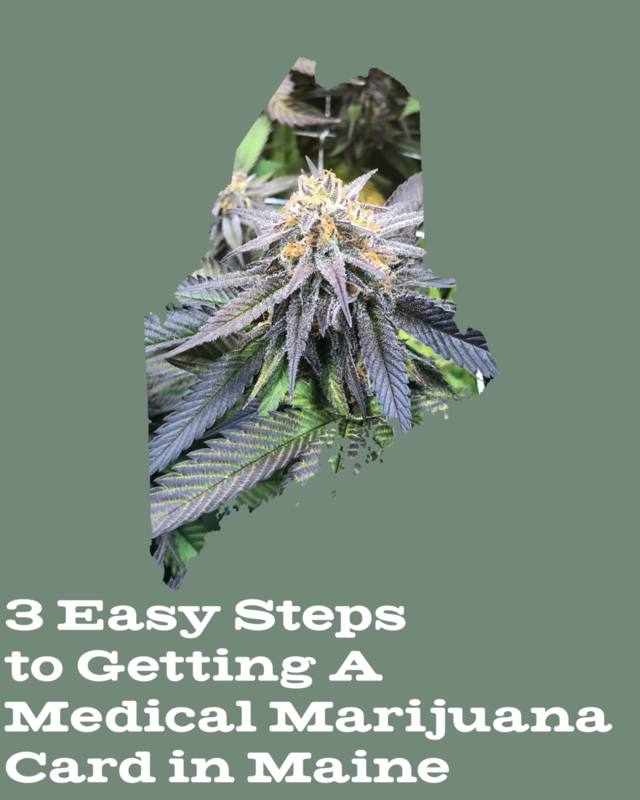 You'll receive a clear and easy to follow guide to getting a medical marijuana card in three simple steps. We’ll also discuss the steps you'll need to take to be able to purchase medical marijuana online and have it delivered directly to your home. Let’s get started! Every state is unique in their formulation of marijuana laws and regulations. Maine is especially unique at this time, having passed recreational laws, yet still relying on the medical system for sales and distributions. Let's take a look at what is currently legal and what processes are in place for the legal purchase of cannabis in Maine. Any adult, age 21 and over, is allowed to be in possession of up to 2.5 ounces of marijuana. Anything over that amount is punishable by law. Each adult is allowed to grow up to three mature marijuana plants, twelve immature plants, and an unlimited amount of seedlings. They can grow in their own home, or in another's home with the owner's permission. Marijuana use is allowed only on private property, and may not be smoked or consumed in public. Driving under the influence of marijuana is strictly prohibited. These laws apply to everyone, even if you’re a registered Medical Marijuana patient. If you are certified as a medical patient in Maine, you can legally grow up to six mature plants. You can also designate someone else to grow for you or choose a dispensary to serve as your provider. All sales of marijuana are prohibited, except by state-licensed medical dispensaries and caregivers. At this time, there are only a handful of physical dispensary locations throughout the state, and even fewer offering online delivery services. The Maine Cannabis Exchange is among Maine’s premier Caregivers and deliver certified high-quality medical marijuana and many different cannabis products to choose from. If you want to buy cannabis legally in Maine, you must carry a Marijuana Medical Card, until the state agrees on recreational marijuana regulations. Keep reading to learn how easy it is to get it! When adult use retail shops open up in Maine next year, it will no longer be necessary to hold a medical card in order to purchase cannabis. In the meantime regulations for recreational marijuana in Maine are being written, the State’s program has expanded qualifications for getting a MMJ card. Previously limited to only a handful of qualifying health conditions, now a certified medical professional can provide a recommendation to any patient seeking to use medical marijuana at their discretion. Licensed doctors and nurse practitioners who want to recommend marijuana as a treatment option must apply for a Medical Marijuana Certification account through Maine's Department of Health and Human Services. If your medical professional is certified to issue MMJ cards then they will be able to immediately issue a printed certification card, which immediately qualifies you to purchase marijuana at any medical dispensary or caregiver. The price for your card will vary depending on the doctor’s office, ranging from $100 – $300. Most offices have a set price for new patients and a slightly lower rate for returning patients. Attend the appointment with certifying practitioner; walk out with your printed Medical Marijuana card in hand. Find a state-licensed dispensary or caregiver to purchase your marijuana from, such as the Maine Cannabis Exchange. The gap between the passing of recreational laws this past summer and the hold up on allowing retail stores and dispensaries to open up has created a gray market area. Since people are now allowed to possess cannabis, yet are limited in terms of purchase options, an online delivery market has boomed in order to fill the demand. If you live in Maine you can now order cannabis online and have it delivered directly to your home. Maine Cannabis Exchange is an excellent online resource for top quality, locally grown cannabis products. You can view our menu online and then order directly. You will need proper documentation of your Medical Marijuana card to order through MCE. To place your order, simply give them a call at (207) 221-2277 or email them Info@MaineCannabisExchange.com. Connect with MCE through social media and become a part of a community dedicated to sharing the medicinal benefits of marijuana. Thanks for reading our blog, and please continue to follow us for more info about marijuana and help in choosing your medicine.